Trivia: She is the 'face' of Emporio Armani designers. James Bond first meets Vesper Lynd on a train journey to the Casino Royale in Montenegro, after MI6 boss M gives 007 his mission to bankrupt banker to the crooks, Le Chiffre. The accountant introduces herself to the 00 by simply quipping, "I'm the money." Her initial reaction to Bond's cavalier attitude is frosty, and Vesper quickly puts him in his place. "Arrogance and self-awareness seldom go hand in hand." Vesper is resistant to 007's advances and scathing of her alias as Miss Stephanie Broadchest, mistress to Arlington Beech (James Bond's alias on the Casino Royale mission). It is not until Bond and Lynd are sent to Italy for rest and recuperation that the pair reveal their true alliances. Vesper admits her initial assessment of James had been wrong. 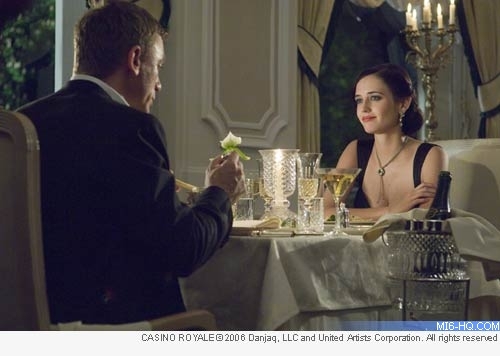 Vesper Lynd works for the Treasury Department and is sent to assist 007 on the "Casino Royale" mission. Intelligent, beautiful, but with many dark secrets, Vesper is the ultimate Bond girl. It is Vesper's job to control the purse strings of the mission, and to decide how much of the Treasury's money Bond can risk in his poker game with Le Chiffre. Having to share a long train ride with Agent 007, Vesper soon sums up Bond and puts him "in his place". As with Fleming's character, Vesper is business-orientated and does no take to Bond's attitude. Bond and Vesper eventually warm to each other as they spend more time together, with 007 ultimately naming his new vodka martini recipe after her. Contrary to Fleming's character, the Vesper of the film appears to have shed much of venerability and adopted the recently cliched Bond Girl mentality. Although there are hints to past troubles, Vesper's character is not the "damaged goods" of the 1953 novel. Her fate, although tragic, is not the same as the literary one, with Vesper's demise becoming more cinematic - but still as poignant for Bond. "So as charming as you are, Mr. Bond... I'll keep my eyes on our government's money and off your perfectly formed arse." Born on 5th July 1980 in Paris, France, Eva Green is a talented actress and composer. Once described by director Bernardo Bertolucci as "so beautiful it's indecent," Eva is the daughter of French actress Marlène Jobert and Walter Green a Swedish dentist. In Swedish, her surname is pronounced "grain" or "greyne". While many believed Eva was just an Anglicised "stage name", it is in fact her birth name. She studied in Paris and then in London at the Webber Douglas acting school. She performed on stage in productions such as "Jalousie En Trois Fax" before making her film debut as the female lead in the Bernardo Bertolucci's 2003 film "The Dreamers", starring Michael Pitt and Louis Garrel. In addition to playing a lead role, she also composed the music for the film. This debut performance brought her critical acclaim and she has finished her second movie role in the French film, "Arsene Lupin", directed by Jean-Paul Salomé - co-starring Romain Duris and Kristin Scott Thomas. Shortly after, Eva was said to have turned down a major role in Brian De Palma's "The Black Dahlia", for the fear of being typecast. In 2005, she had her first important role in Hollywood as Sibylla of Jerusalem in the movie "Kingdom of Heaven", her third film, as the female star alongside Orlando Bloom and Liam Neeson and directed by Ridley Scott. The year following her appearance as the doomed Vesper in "Casino Royale", Green starred in the fantasy feature "The Golden Compass" - once again opposite Daniel Craig.